Image taken from video shows one school bus driver using his bus to stop a cyclist who had just passed a school bus whose red lights were flashing. Williamsburg, NY - Angered by multiple incidents of bikers illegally zooming past stopped school buses, residents of Williamsburg are taking action and demanding that the NYPD crack down on rogue cyclists. 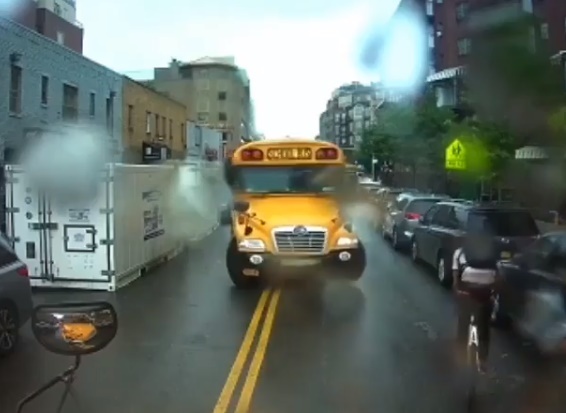 Video posted to several social media accounts shows one school bus driver using his bus to stop a cyclist who had just passed a school bus whose red lights were flashing. That footage comes on the heels of multiple disturbing videos showing bikers flouting the law and crashing into children. Three incidents, all of which took place in Williamsburg, were posted by CBS News. School bus driver Zalman Isenberger expressed concern for the safety of his young passengers. “The kids come down from the bus and the bikers just almost kill the kids,” said Isenberger. One video, take in mid-July, shows a little girl walking across the street after getting off a school bus near the intersection of Lee Avenue and Middleton Street and being struck by a bicyclist who ignored the bus’s flashing red lights and extended stop sign. According to the New York Post, the biker said wet roadway conditions prevented him from stopping. The child was taken to NYU Langone Hospital – Brooklyn to be treated for leg pain. A second video taken in May shows a cyclist riding in the bicycle lane pedaling past a stopped bus, making a direct hit on another child. New York State law requires all bikers to comply with all rules of traffic that apply to motorists, which includes stopping for any stopped school bus whose red lights are flashing. Yet another video clip demonstrated that it isn’t just stopped school buses that have bikers breaking the law, with a cyclist flying through a red light and crashing directly into a baby stroller. Bikers said that they are being unfairly targeted. This past May, the Transportation Alternatives blog issued a reminder to cyclists to stop for stopped school buses, noting that it is typically motorists who are the prime offenders, not bikers. And Williamsburg biker Mandel Levine said that it is important for pedestrians to be fully aware of their surroundings. It's De blasio's time he'll do anything for the bikers instead of caring for the rest of the citizens of the city. thank Bloomberg for adding these stupid bike lanes. Bicyclists seem to believe that "rules of the road" designed for the safety and well-being of all do not apply to them - just my experience. Am I reading Right? : "People are not aware & need to be on the lookout for Bikers"!! What a preposterous statement! While its always a good idea to be on the alert, Ration has it the other way around: A cyclist is the one who moves rather quickly, so he needs to be more mindful with "his or her surroundings"!! Someone who is strolling on the street can be vigilant to a certain degree, but not when someone comes flying into you out of nowhere! Let's put things in perspective. It’s disturbing and aggravating . However, motorists , including Jewish ones , are just as menacing on the roads . Where’s the outrage over that ? We absolutely should thank him. bike lanes are great. Bikers who don’t obey the law are the problem. Then again, reason and perspective isn’t something anybody can expect from you. Anyone ever see how school buses in BP & Willy abuse those flashing red lights ???? Or how everyone drives through red lights !!! That's "The pot calling the kettle black " !!!! What law was the bicyclist breaking? The bus wasn't even blinking red lights. It's the bus driver that's violating laws by trying to run down a person. My bro Munch says that vigilante justice begins with an incompetent police department. Bikers are the worst. They run the red lights and stop signs, ride on the sidewalks, against the traffic. They seem to consider themselves above the laws of the road. Perhaps its time that when someone 18 and older purchases a bike he must show a photo id which is then registered with the city / state. You said " that it is important for pedestrians to be fully aware of their surroundings." This might be true but this is detracting from the basic rule that the bike operator obey laws and not run into our people and kids. The bikers are scum, and the cops should go after them, in addition to operators of motor vehicles. One time, in downtown Columbus, Ohio, I was making a legal right turn with nobody in sight; all of a sudden, some idiotic bicyclist coming from in back of me on my right (he squeezed in between my car and the curb), actually tried to go straight, and cut me off. It is a good thing that I'm a defensive driver, and I avoided an accident. Y are they only showing a portion of the video? This is the problem? We hafta garner support for change. The video in its entirety shows 3 incidents how bycicalists are passing the STOP sign of the bus and crushing kids. 3 such incidents recorded plus one passing a red light and overthrowing a baby in a carriage. Thats a very small part of it and doesnt show the importance of getting these bikes off our streets. Read the article again. You don’t seem to grasp the scenario. Cuz u dodnt c the full picture. He was trying to run thru a stop sign. To #19- Learn how to write proper English; go back to school!